Sometimes what looks like friendly behavior is really an attempt to get one's neighbor eaten by a wolf before oneself. Sheep, for instance, seem cozy enough in their flocks. What's a better way to travel than surrounded by 100 percent merino? But the real reason they stick close to their neighbors is to save their own woolly rear ends. The question of what motivates seemingly community-minded animals is a classic one in biology. Do the birds in a flock, or the fish in a shoal, just enjoy each other's company? Do they rely on each other's eyes to spot a predator before it gets too close? In an often-cited 1971 paper, British evolutionary biologist W. D. Hamilton suggested that the answer was simple geometry. An animal never wants to be the nearest potential prey to a predator, Hamilton said. To increase its odds of survival against a lion, a wildebeest should put itself closer to other wildebeest. And even better than being near a few other defenseless grazers is being surrounded by a pack of them. The more edible neighbors are between you and a hungry mouth, the safer you are. Hamilton's theory was called the "selfish herd." To find out whether a non-hypothetical herd really behaved as selfishly as Hamilton predicted, researchers led by Andrew King at the University of London used a flock of sheep wearing GPS-equipped backpacks. And one sheepdog. Three times, the team gave the Australian kelpie the command to round up the flock of 46 sheep. With their backpacks on, the sheep responded as usual by running around in a panicked clump. Then the researchers used the GPS data from the backpacks to map exactly how each sheep had moved, second by bleating second. They saw that the sheep started reacting when the running dog was about 70 meters away. A few moments later, the sheep had formed as tight a flock as they could. A sheepdog (approaching from the top right corner) drives sheep into a clump in seconds. 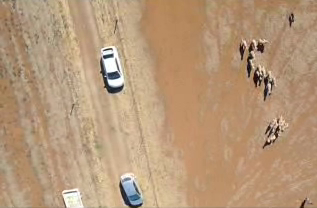 In keeping with the selfish herd theory, the sheep used their flock to buffer themselves from a threatening attack. But the way they did it was surprising. Hamilton had suggested that animals might condense their herd, when a predator approached, by following an easy rule: Move toward your nearest neighbor. 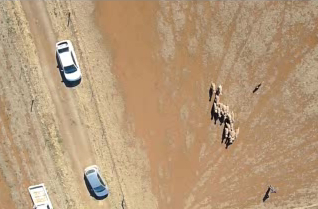 King's team found that the sheep were following a different guideline: Always move toward the center of the group. As if armed with a protractor and a map, sheep zoomed toward the middle of the flock, however dispersed it was to start with. It's a slightly more complicated maneuver, since sheep must consider the positions of many neighbors at once. The authors write that while "a precise calculation of the flock centroid may be unlikely"—as sheep brains probably aren't equipped for much geometry—"sheep may be able to approximate where that target location ought to be." King is interested in flocking, selfish or not, as a social behavior. His research group has also studied how individual fish "personalities" affect schools; how baboon troops forage for food and coordinate their travel; and even (using GPS baseball caps) how groups of humans move. But King's coauthor Jenny Morton has a different motivation. She studies brain degeneration in Huntington's disease and uses sheep as an animal model. By learning what rules the sheep in a flock usually follow, she hopes to better understand what happens as their brain cells—and their geometry skills—break down. 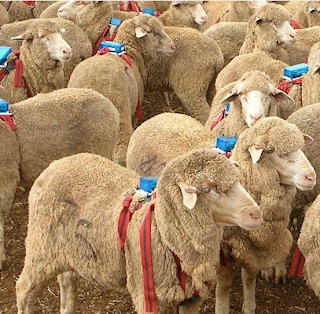 Images: Sheep with GPS backpacks on. King et al., Current Biology Volume 22 Issue 14. I always suspected sheep were baa-stards. Incidentally, King's at Swansea, not University of London (which is a largely administrative term now anyway) - although Hailes is at UCL, which huddles in the UoL to avoid being singled out by Imperial. Journalists have an unfortunate and mistaken assumption that research is only interesting if it finds something "surprising" that contradicts previous beliefs. That said, research like this that carefully tests (and in this case, happens to confirm) long-standing assertions is newsworthy, even if the results are unsurprising. In fact, experiments that support and confirm theory are at the heart of what science is about. Theories are developed, experiments are designed to test them, and the theories are either supported (as in this case), rejected, or modified. The public would be well-served by journalists who report on good science without a bias towards "surprising" findings, and without feeling as though some sort of "surprise" must be described, even when there is nothing surprising. The "new research upsets previous assumptions" narrative leads the public to think "theories" and established science are in general wrong. In fact, theories, based on solid science, observation, and experimentation, are often robust. Wouldn't a "move toward your nearest neighbor" approach often lead to smaller, scattered clusters that don't afford the same level of safety for anyone? It seems like an entire flock using that strategy might get selected out pretty rapidly. Also, in the presence of a single threat (the dog), wouldn't the most "selfish" behavior be to put the centroid between oneself and the threat? Highly relevant to traders and investors.